To get to the configuration page, first click the menu tab "Admin" then click "Configuration". Company Name If you put your company name here it will show up in the header on all pages of SS-CMMS. Date Format You can select the date format used by SS-CMMS. Choose between UK d-m-y, US m/d/y or Mil dd Mon YYYY. Defaults to UK d-m-y. Time Zone is the only mandatory entry. Select the Time Zone for your location fron the drop down menu. Default Assign To Name This is the name that all new Work Orders and PM's will be automatically assigned to. Use the dropdown list to select individual user or "All". NOTE - You will be able to select a different user when assigning Work Orders. Allow Techs to see All Work Orders? With the set to Yes All technicians will see All Work Orders regardless of whom they are assigned to. Allow View Only Permissions to see All Work Orders? Normally View Only users can only see their own Work Orders. Setting this to Yes allows them to see All Work Orders. Set Complete WO's to Pending This is used if you want an Admin to verify closure of all work orders. Once a tech closes a work order, it will go to the pending que for Admin to review. The Admin can then close or re-open the WO. Default Email Work Order Notification Use this to setup automatic Work Order/PM notification by Email/SMS. You can turn this option on or off. Emails will be sent to the Email/SMS address set in the Add/Edit Users Page. If you wish to send to SMS Text using an Email Address click HERE for more information. Send Email to Reported By on WO Completion: When set to Yes will automatically send an Email to the creator of the Work Order notifying of completion. 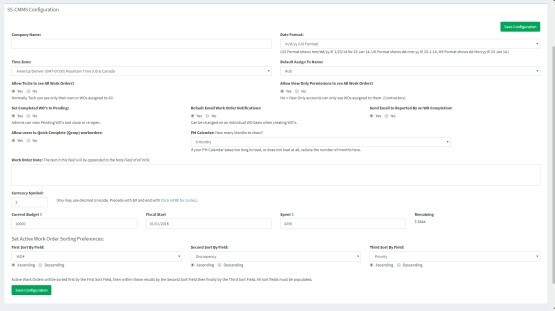 Allow users to Quick Complete work orders: Allows users to immediatly close work orders without filling out information. PM Calendar: Use this to set how many months will be shown on your PM calendar. If your calendar takes too long to load, or never loads, try lowering this value. Rows per Page: Set how many rows of information you wish to display in all tables. Work Order Note: This field allows you to input a note that will be automatically put into every work order created. Currency Symbol: Use this to choose your currency symbol. You may use decimal Unicode. Budget Information: Enter your budget and fiscal start entries. You can also change how much spent here as well. Work Order Sorting Preference: This area allows you to have your Work Orders sorted by your preference. All Work Orders will be sorted by the First Field first, then the Second field and finally the Third. You can choose ascending or descending as you wish. Sorting is alphabetical or numerical depending on the field. Use the dropdown menu to select sort by preference. Bulk Deletions: Use these buttons to delete every entry in each of the categories. NO UNDUE, USE WITH CAUTION! It's best to make backups (Admin/Backup Restore) before mass deletions just to be safe.